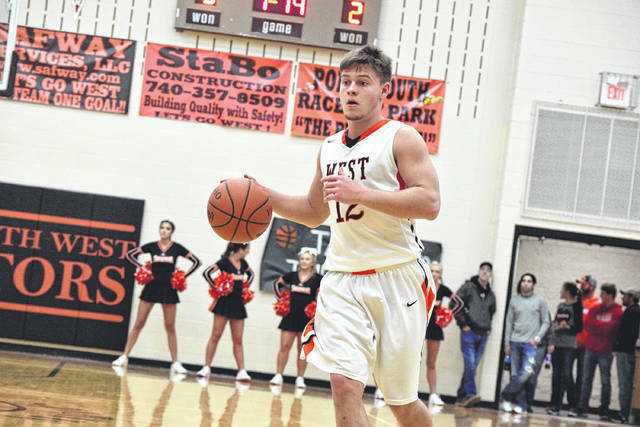 West’s Josh Berry moves up the floor with the basketball. West’s Jordan Frasure gathers for a shot attempt on Monday evening. 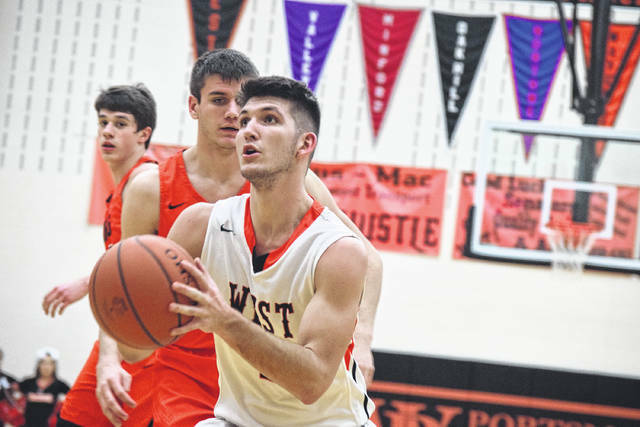 West’s Dylan Bradford looks for an open teammate. Wheelersburg’s Connor Mullins evaluates his options against West’s L.T. Maynard on Friday evening. Wheelersburg’s Cole Lowery sizes up the defense on Friday evening against West. Wheelersburg’s Cole Lowery brings the basketball up the floor. West’s L.T. Maynard pulls up for a short jumper against Wheelersburg. WEST PORTSMOUTH — When a talented unit plays with a determination that is unmatched by its opponent, the results usually tend to be scary. On Friday evening, the Wheelersburg Pirates’ boys basketball program put together yet another truly scary result on the board as five first-half threes from Connor Mullins, the all-around play of Cole Lowery, Tanner Holden, and Justin Salyers, and a truly stifling defense allowed Wheelersburg to go on as large as a 15-0 run as the Pirates rolled to a 67-41 victory over the West Senators’ basketball program on Friday evening in West Portsmouth. 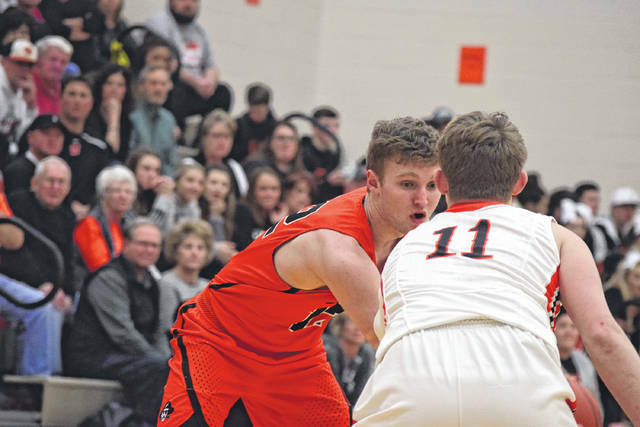 For Steven Ater, the effort of Wheelersburg’s defense to remain as committed as it did throughout the contest was a credit to his personnel. As for Bill Hafer, the result was simply a part of playing against a team that is playing, to put it simply, stellar basketball. From the opening tip, Wheelersburg wasted no time establishing a hold on the affair as the Pirates jumped out to a large 7-0 gap behind the play of Mullins, Lowery, and Holden, who launched a beautiful 40-foot bounce pass straight on the money to a streaking Mack Dyer who quickly converted the junior forward’s bounce pass into an easy layup. However, the Pirates — who would never lose the point over the entire affair — were just getting warmed up. 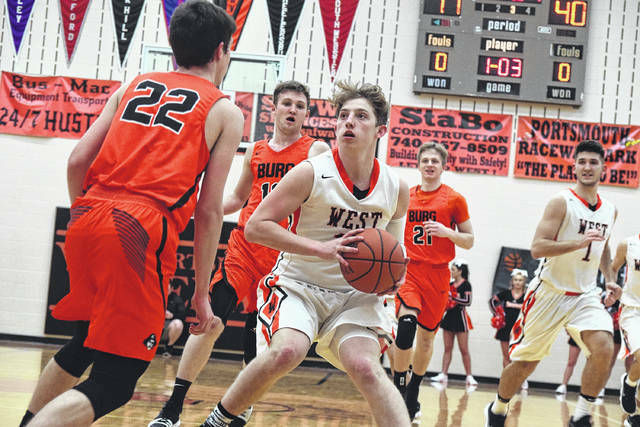 When West cut the deficit to a 9-4 margin — including a field goal from Frasure that marked West’s first of the contest with 2:23 to play in the opening quarter — Mullins, who nailed a game-opening basket from beyond the arc, really got heated up. The junior nailed back-to-back three-point field goals from the right side of the floor as the Pirates ended the first quarter on an 8-0 run en route to establishing a 17-4 first-quarter advantage. Mullins ultimately finished with 17 points to aid Wheelersburg in its efforts. In the second frame of play, however, L.T. Maynard and Jessie Johnson were able to rally the Senators back into the affair with their offensive scoring punch. Maynard, who proved to be a difficult cover with his array of hesitation moves, and Johnson, who added a three from dead-on in addition to a pair of free throws, combined for 12 points over the game’s opening 12 and a half minutes. 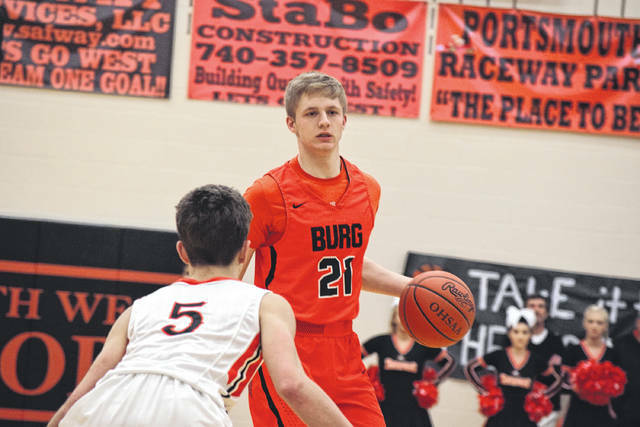 But as Hafer referenced, Wheelersburg’s pushes — especially in the second quarter of action — proved to be too much. With the score at 23-14 in favor of the Pirates after the bursts of Maynard and Johnson allowed West to close the gap, Wheelersburg responded with its best basketball of the night as a Trent Salyers basket ultimately led to two Pirates’ takeaways that resulted in Mullins draining back-to-back threes from the left wing. Holden’s play around the rim, along with a buzzer-beating three-pointer from NBA range by Lowery, allowed the Pirates to take a 38-14 halftime lead thanks to a 29-10 spurt from Wheelersburg over the last 10 minutes of the half. But as strong as the offense was, the defense was the area where Wheelersburg proved to be lights out. Dyer, who held Frasure to just two first-half points and five total tallies through three quarters of play, was a prime example. Holden, who continued to be consistent throughout the contest, along with Lowery and Salyers, then took over the scoring load in the second half of play. The former scored six of his points during an 8-0 Wheelersburg run, with Lowery obtaining 11 of his team-high 19 in the second half and Salyers adding four of his eight points in the third quarter to push the lead out to as much as a 50-20 lead behind another 8-0 spurt before the Pirates ultimately settled for a 52-25 advantage at the end of the third quarter. In the fourth quarter of play, Frasure did his very best to bring West back into the fray as the Senators attempted to rally for one final charge. 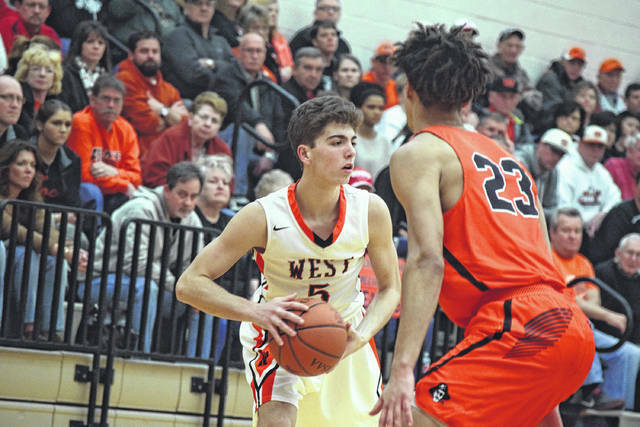 The senior scored 12 of his team-high 17 points in the fourth quarter and brought West within 54-32 at one point, but Lowery ultimately answered with nine fourth-quarter points to help bring the game to its conclusion. With the victory, Wheelersburg improved its overall record to a strong 15-3 while also improving its overall SOC II mark to a stellar 11-2. The Pirates have OVC competitor South Point on Tuesday evening before playing host to Valley in its final SOC II contest of the year. 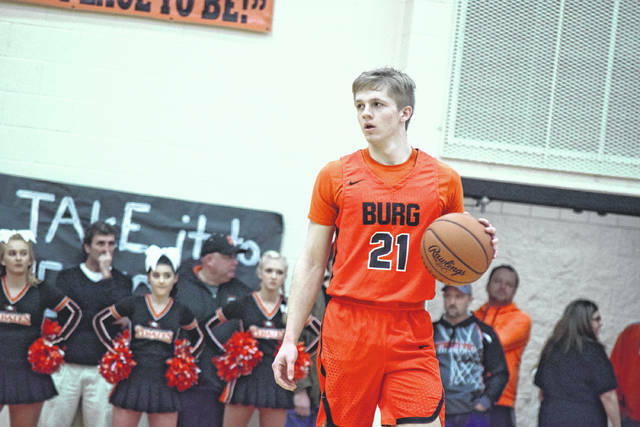 A Wheelersburg win in the latter affair, along with an Oak Hill loss to either Northwest or Valley, would allow the Pirates to share the conference title with the Oaks. As for West, there isn’t too much to be disappointed about, especially considering that a win over Chillicothe Huntington on Saturday evening gave the Senators its fifth victory in over its last eight affairs — with its only losses during that span coming to the Pirates, the Oaks, and Georgetown, who has already clinched the Southern Buckeye Conference Championship. The Senators currently sit with a respectable 8-10 overall mark and are 5-8 in SOC II action.